Like Ms Rebecca Bernauer murdered before she could give evidence against police and like all the youths that died of a heroin overdose after police sold heroin for a slimy mackeral. .
People who can prove that there has been an attempt on their life by the NSW Police Service and the bikies. Those who are still alive to prove it ought to be given the right to prove it before their taken away at the hands of the government. The evidence my friends you have received by fax but not completely investigated by those who refuse to have it done. Directives issued to our democratic agencies and institutions by the government who veto complaints. Complaints that have either been interfered with or directed not to be looked at. For instance who is going not only to check the vehicle registration numbers and be trusted to do so? The perpetrators? I do not think so. Our political leaders are all messed up because they do not see equality as omnipotent when they make decisions for all of us. In other words they are not in the Same Boat. Bob Carr, if you are in the same boat go to jail. Go directly to jail. Do not pass go and do not collect $200. Throwing people on the scrap heap because of your own policies that do not work. First you want a taxpayer and when that fails you want a garbage bin (jail) for our young and old alike. How about a new policy? What you see is what you get. Try leading by example and answer the allegations I put to you. 1. 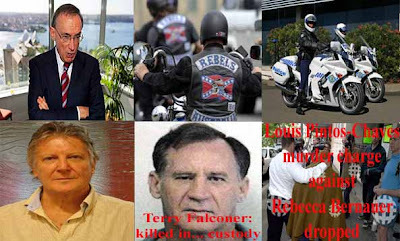 How many NSW Citizens, who have stood in the way of your political agenda did you murder? 2. How many times did your police-bikies and militia repeatedly assault NSW citizens? 3. How many times did you convict innocent NSW Citizens? 4. How many times did you set up NSW Citizens for crimes they never committed?